Put up your feet or put down your drink on one of these Colston's leather ottomans. Deep tufted detailing add a dramatic and classic appeal. 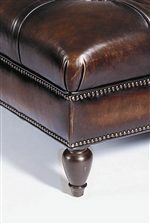 Exposed wood feet and decorative nail head trim adorn these leather ottomans. A rectangular or square shaped is featured to use as a cocktail table, extra seat or footrest for two! Functionality and style is what the Colston leather ottoman collection will provide for your home's decor. Browse other items in the Colston collection from Miskelly Furniture in the Jackson, Pearl, Madison, Ridgeland, Flowood Mississippi area. Decorative Nail Head Trim and Exposed Wood Legs.